Artist? Want to exhibit your work during this month’s Fringe Festival? Five-o-clock today is the deadline for submissions to the Visual Fringe exhibit at the 2010 Windsor International Fringe Festival. What is the Fringe Festival? It’s a ten day performing arts event featuring live theatre and both indoor and outdoor events including the Chalk & Chocolate Festival, the Windsor International Buskers Festival, Buskin’ to the Beat and Visual Fringe. Visual Fringe is looking for all forms of art including painting, photography, sculpture, experimental video and multimedia installations among any other type of visual arts. pixels) representative of your proposed work. * Snapshots, diagrams or other supporting visuals and written proposals are also accepted (please do NOT submit originals). That’s only 2 things, it’s really easy to submit a proposal to “Visual Fringe” as this Festival of Arts is intended to be OPEN & INCLUSIVE! c/o Artcite Inc. 109 University Ave. W. Windsor, ON N9A 5P4. Please put “Visual Fringe 2010 Submission” in the subject heading. Need more information? Visit the Facebook Event for the Visual Fringe call for submissions. 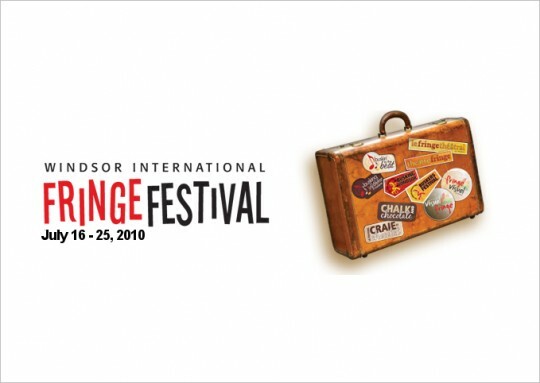 The 2010 Windsor International Fringe Festival begins July 16th.